Why book a Master of Ceremonies? It’s completely free for Couples and their guests and no appointment necessary. As recommended Master of Ceremonies and DJ I’ll be on hand to answer any questions about music, atmosphere and flow and would be delighted to chat with you about your special Day. 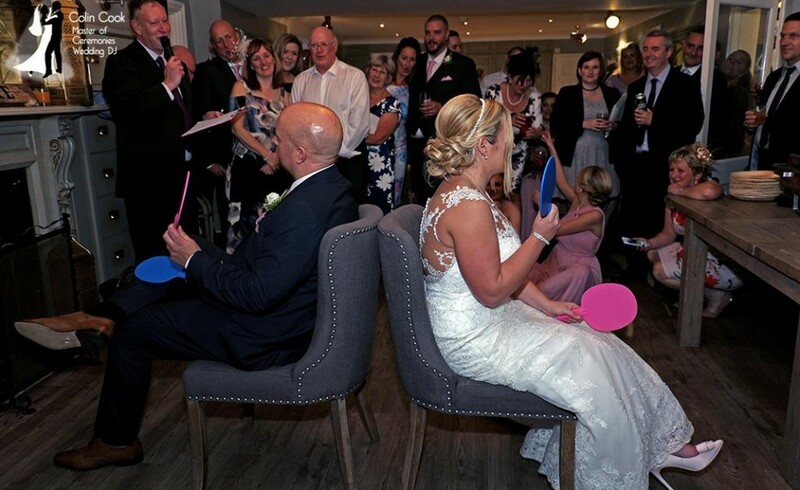 For ways to have the Best Wedding Ever – a day full of laughter, fun, music and great memories pop over to see me! 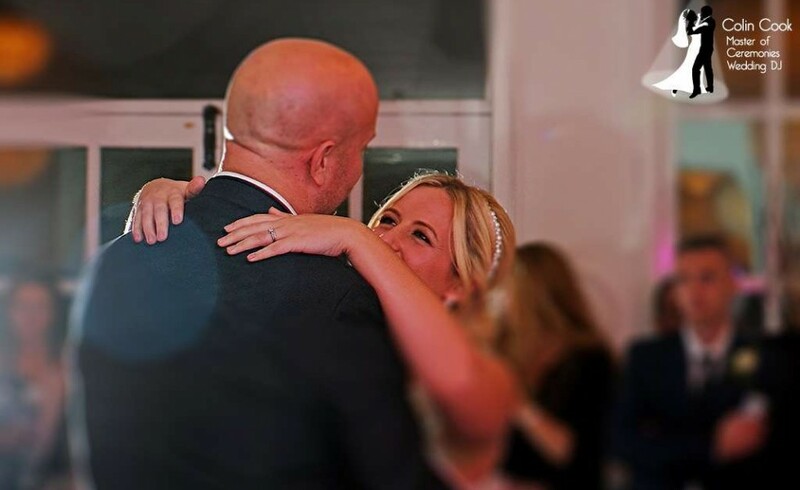 In asking Colin to help with our wedding planning during 2016, he gave us so much helpful advice on how we could develop the format of our day and use a range of music choices, and his master of ceremony skills and personality, to enhance and make each part really memorable. Colin’s contribution helped us be more confident in planning the wedding ‘our way’ to ensure it really was as personal as it could be, involving humour, nostalgia and so many personal touches throughout our day that it ended up feeling totally perfect. We wanted to have, what we described when we met as an ‘informal but formal’ feel which would use the best of Crook Hall and its beautiful gardens during the day and ensure we had a cracking party in the evening. We did just that aided by some glorious sunshine! Leading up to the wedding Colin helped us develop and deliver a fantastic play list and on the day managed our music so professionally inside and outside the hall as well as providing a Master of Ceremonies role. I had not appreciated how much Colin was going to help ‘glue’ the different parts of our day together in his Master of Ceremonies role – His contribution made a huge difference to the flow of the day from chatting to guests on arrival, helping with our amazing marryoke, doing a personal introduction about us to our guests ahead of dinner, reading out comments on our postcards, dealing with the cake cutting, filming and capturing additional photos after the photographer had gone and even ensuring our dressing up box got maximum usage at the evening party – alongside effortlessly delivering the music – this left us with very little to think or worry about, so we enjoyed every minute of our day. Colin is a total professional and listened to what we as the Bride and Groom wanted our wedding to feel like, and his vast experience helped us achieve exactly what we wanted. 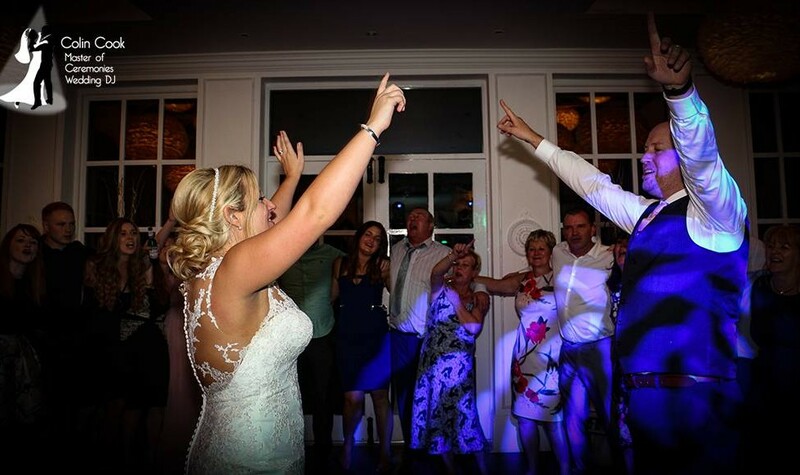 He is professional, approachable and from our experience went the extra mile to help ensure our wedding felt unique – I would highly recommend Colin on both music and his master of ceremonies role. We would like to say a very big thank you for providing us with a perfect evening reception at Eshott Hall on Thursday 16th August. Your advice, professionalism, personal touches and eagerness to accommodate our ideas provided us with a really enjoyable and smoothly run evening. Our guests commented on the fantastic selection of music played during the wedding breakfast and in particular the range played during the evening reception. Most guests were up on the dance floor at some point or other, most of them for at least a little while, and Uncle Ray (rarely goes near the dance floor) barely sat down all night! A massive thanks for your efforts at our wedding celebration party last Saturday. Lots of our guests have contacted us and said what a great time they had. The atmosphere you created was top drawer. We spent a lot of time searching for someone suitable to coordinate/ orchestrate the formalities of the evening as well as the music. Your professionalism and discreet style exceeded our expectations. We had a fantastic night and given the chance we will recommend you to anyone organising a wedding event. From start to finish we had great time. Sorry we haven’t contacted you since our wedding – everything has been go go go!! We both would just like to thank you so so much for providing such a fabulous service and for contributing to making our evening reception perfect! The lighting that you provided created the perfect atmosphere and it was magical to see the lighting change as the evening progressed! The music was perfect! You really listened to what we wanted and I remember loving EVERY single song! I believe i may have dominated the dance floor which is only a good sign of your work! We really couldn’t recommend you enough to anyone planning a wedding! Your professionalism and attention to detail is what makes you and your service unique and we’ll be spreading the word to all our friends! Thank you again. Your professionalism mixed with your friendly nature allowed us to sit back and relax through the day knowing you had it all under control! We will be passing on how pleased we were with you to Claire at Alnwick Gardens and will be sure to recommend you to anyone else who is getting married up in the North East! Thank you again for helping make our day so special. So sorry im late in sending this. Just want to say a HUGE thank you to you both for making our wedding night unforgettable. The music was just amazing. Everybody loved it. What made mine and Johnnys night was the fact the dancefloor was never empty. You’re a brilliant DJ. Highly recommended. I hope this email finds you well and you have had a busy and successful few months! I cannot believe how time has flown since our wedding and I’m only now just sitting down to write to you! Jean-Luc and I have both been busy with work since the wedding and cannot believe we are already in September! Anyhow, Jean-Luc and I have been meaning to write as we would like to express our huge thanks and appreciation for everything you did for us on our wedding day!! We had the most incredible day and the music throughout really was absolutely perfect. You did a wonderful job of keeping all our guests on the dancefloor and we had so many compliements about you from all the guests who all had a fantastic time. You really did manage to have something in the set for everyone and one of my favourite moments from the wedding was seeing a giant dance-off circle take shape with everyone up there having a fantastic time! We have to also say thank you for all your help in preparing for the day – your input and your guidance on what kind of music would work and when – particularly for the ceremony and final dances of the evening – the structure it provided helped make our day so perfect and the choices you guided us on were just spot on. I hope you remember the day as a fun one too – we certainly had the perfect day. You were a pleasure to work with and really did have such a major role in making the day so perfect. We just wanted to drop you a quick email just to say how much we appreciated all your hard work and effort regarding our wedding at Woodhill Hall. From the first meeting with you any fears we had about using an MC evaporated. Your commitment to what you do and in ensuring you take care of the day is fantastic. You listened to exactly what type of wedding we wanted and tailored this perfectly, our guests have all commented on how well the day went and this was largely down to you. The extra ideas such as “intros” and “Mr & Mrs” helped make the day and really got everyone involved. We can’t really recommend you any higher than we do, please feel free to share these comments on any of your social media forums as we genuinely feel more people should be aware that with you it’s not just a DJ you’re getting. It’s a service which we now could not imagine our wedding without, we could relax (as much as possible) and enjoy the day knowing that we had someone professional taking care of all the little extras that made the day perfect. Thanks for the photos, they’re great! We were both so pleased with your services throughout the day. You hear stories about the stereotypical “wedding DJ” so we were wary at first to even have a DJ. We found you to be professional and obviously very good at what you do. The music was spot-on all night and was exactly what we wanted, you tailored it perfectly! The information and correspondence before the event was very useful, particularly in getting us to think about what we did and did not want played. We particularly liked the way you ended the night with the circle and the final song. Its a really great idea! The mood lighting looked great and really added to the atmosphere in the marquee. Also the way you handled the speeches and general MC’ing was fantastic and ensured everything flowed really well throughout the day. I can honestly say that you went way beyond our expectations and we were more than satisfied with your service. I’d have no hesitation in recommending you to anyone else. You were slightly more expensive than some of the quotes we have, but I can see why. You get what you pay for! Tim and I would like to thank you so much for the wonderful DJing you did at our wedding on 4th August. You were so absolutely professional throughout and allowed us to have the disco we really wanted. Thanks for playing our songs, ignoring the guests requests for rubbish (!) and keeping the volume where we wanted it. The whole event for us was obviously very special but what made it better was the compliments we received, many of which were directed at you. They all seemed to have had an absolutely brilliant time and we were therefore extremely happy with it all. We would be more than happy to write feedback on your website if you would like this. Once again, many many thanks for your excellent service! Craig and I just wanted to say a huge thank you to Colin for our wedding night disco. Your professionalism and dedication to ensuring our night ran perfectly was there for all to see, having Colin as our DJ meant that we didn’t require any other entertainment on the night. My guests all commented that the music played was excellent and there wasn’t a moment when the dancefloor was empty. Colin also provides a service called Moodlighting, I would recommend that no matter what venue you have (our wedding was at Wynyard) use this service that Colin provides. The lighting changes the room into a magical place. I was looking at other comments from other happy customers of Colin and one thing I would reiterate is, you will find these services elsewhere, but if you want perfection, a gentleman that really cares about making your day special and someone who is happy to give advice but is also flexible in his approach, Colin is your guy!! There aren’t enough words to say how amazing you both were throughout our entire wedding, and we’ve lost count of the number of times you went above and beyond to make our day better. We couldn’t have wished for a better MC, DJ (and assistant) and generally all round f*cking awesome people. You will forever be a huge part of our memories of our wedding day. Just a quick note to say HUGE THANKS to you for being DJ and master of ceremonies for our wedding. Despite the biblical rain, we had a wonderful time and it actually only served to make things more intimate for us and our guests huddled in the bar and treehouse. I was blissfully unaware as to the very last minute “where will the ceremony be” dramas and understand from Andy and best man John that it was literally with minutes to go you re-set up and had everything good to go. I really can’t tell you enough how great you’ve been to work with, how great we felt your music choices were when we’d really just given a general idea for you and how fantastic a job you did motivating so many guests up on to the dance floor considering they’d all eaten such a big meal fairly late into things. The “I like big butts” was a particularly special touch and Kenn and Sheila managed to get a cracking shot of Andy all gorilla masked up with banana! I’m more than happy to share Facebook pages, or provide a testimonial etc. as to just how thrilled we were. Do let me know. Just a quick note to say thank you for all your hard work and everything you did to make our big day so special. From the outset, you were so helpful and easy to work with, answering our many questions and being willing to go above and beyond to make sure our day was perfect. And perfect it was! The Great Hall looked absolutely amazing with the Uplighting, the music was just spot on (even our ‘favourite songs’!) and you were a fabulous Master of Ceremonies , with your quick thinking keeping our day alive and on track! We really couldn’t have done it without you and had the best day ever – thank you! We have had a lot of comments from guests about how great (and unobtrusive!) you were too. Although it was a long day for you, we hope you had fun too! Thank you for everything you did to make our day so special! The mood and atmosphere was perfect and our guests truly enjoyed themselves! Thank you for making our event so memorable! Thank you so much for everything you have done to make our wedding day so special. We truly appreciate everything you did! From taking time to understand what we wanted, getting in touch with other vendors, researching everything for the monogram (which looked amazing), to setting up the lighting for the room and band and doing our personalised introduction and the DJing, it all came together brilliantly! Colin we honestly cant thank you enough for yesterday. You made the day what it was. You helped with everything and went out of your way to make it amazing . So many of my guests commented on how nice , helpful friendly and kind you were. You couldn’t do enough for us and for that we will be forever grateful – 5* service. Great music which we danced to till the lights came on. Thank you for giving us a wonderful wedding reception entertainment. The lighting looked fabulous and everyone enjoyed the music tremendously. We had a brilliant night. Thank you for also sending the photos – if you have anymore please do send them our way! Once again, all our thanks for a great evening. Many thanks for a brilliant disco – your professional approach is excellent and the lighting you provided was superb – it made the whole evening a wonderful success enjoyed by everyone! We have just waved the last of our Japanese relatives off back to Tokyo after a week at Woodhill Hall and a canal boat trip around Yorkshire! Thanks so much for Saturday. You were excellent and Rebecca and I couldn’t have asked for more. You created the perfect mood and all the music went down a storm! Lots of guests commented in glowing terms! We were blown away so thanks. We will be recommending you to all and sundry thats for sure!